Judith (Mejia) Colon, a longtime resident of Woburn, died peacefully, October 31st with her family by her side. Beloved wife and best friend of 52 years to Antonio Colon. Loving mother of Patricio Colon, his wife Gloria and Antonio Colon, his wife Lucy, all of Woburn. Cherished grandmother of Antonio, Sheila, Alexander and Sophia, Devoted great-grandmother Romeo, Lola and Luci. Also survived by many friends and extended family in Ecuador. A Funeral will be held on MONDAY at 8 a.m. at the Lynch-Cantillon Funeral Home 263 Main St., Woburn, followed by a Funeral Mass in St. Charles Borromeo Parish at 9 a.m. Interment in Woodbrook Cemetery, Woburn. Relatives and friends are respectfully invited to calling hours on SUNDAY, from 3-7 p.m. Remembrances, in honor of Judy, may be made to St. Charles Church 280 Main St. Woburn MA 01801. For directions or to leave an online condolence, please visit www.lynch-cantillon.com or Facebook under Lynch-Cantillon Funeral Home. Judith (Mejia) Colon, a longtime resident of Woburn, died peacefully with her family by her side, Wednesday, October 31st. She was the beloved wife and best friend of 52 years to Antonio Colon. Born and raised in Quito, Ecuador, Judy was a daughter of the late Manuela Mejia Montalvo. In 1965, Judy immigrated to the United States and made her home in Woburn. While attending Mass at St. Charles, Judy met a young man, Antonio, who would eventually become her husband and together they started and raised their beautiful family. For many years, Judy worked as an assembler for BASF and Fuji Films. Judy loved her pets and spent countless hours taking wonderful care of them. 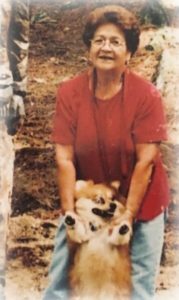 She enjoyed spoiling her grandchildren and watching TV, especially her game shows, professional wrestling, the Red Sox and New England Patriots. She took great pride and joy watching the Red Sox win one more World Series. Along with her husband Antonio, Judy is survived and will be deeply missed by her two loving sons, Patricio Colon, his wife Gloria and Antonio Colon, his wife Lucy, all of Woburn. Cherished grandmother of Antonio, Sheila, Alexander and Sophia, Devoted great-grandmother Romeo, Lola and Luci. Also survived by many friends and extended family in Ecuador. Her wonderful and infectious smile will be missed by all. She has brought much love and joy to all who knew her. We are all lucky to have had her in our lives. A Funeral will be held on MONDAY at 8 a.m. at the Lynch-Cantillon Funeral Home 263 Main St., Woburn, followed by a Funeral Mass in St. Charles Borromeo Parish at 9 a.m. Interment in Woodbrook Cemetery, Woburn. Relatives and friends are respectfully invited to calling hours on SUNDAY, from 3-7 p.m. Remembrances, in honor of Judy, may be made to St. Charles Church 280 Main St. Woburn MA 01801. For directions or to leave an online condolence, please visit www.lynch-cantillon.com or Facebook under Lynch-Cantillon Funeral Home. To the Colon family my thoughts and prayers are with you at this very somber time, may God give you the courage and strength to get through this. Tony I beg for your forgiveness that I cannot be there with you in your time of need, I will explain in person, know that I am praying for you and for her soul to be in the kingdom of God with no more pain or suffering. Lisa and the boys send their love as well. Our condolences to the Colon family. Our 🙏🙏🙏. So sorry to hear of your mom’s passing, please know our love, thoughts, and prayers are with you Tony and all the family. The wonderful dedication you showed to your mom will always sustain you as time passes, the memories she left for you and all her children will continue through generations to follow. God bless! Lucy, thinking of you and your family as you celebrate the remarkable life of your mother in law. God bless you and your family. Sorry for your loss sending prayers for comfort at this time of need. Keeping you all in my prayers. Lucy, as you and your family grieve, I pray you will find comfort in the love and experiences you shared, and the hope of seeing her again when the roll is called. God’s blessings. My condolence to the Colon family, May she rest in everlasting peace. To the Colon family from your extended family here at EOHHS our deepest condolences! I did not get to meet your lovely mom/grandmom but i have heard so many wonderful things! Praying for comfort. Love to your family. perfect angel. God bless you, Judy. words cannot express how blessed I was to have you as my Amiga and neighbor while I was in Woburn. Thank you so much for opening your home and heart to me and my family. We will always remember you with a lot of love. You will be incredibly missed. My heartfelt sympathy to and your family for the loss of your dear Mother. She is in peace in eternal life with our Lord and Savior Jesus Christ. God’s Blessing and prayers always! I am sorry for your loss. She will live on in your memories forever. My heartfelt condolences to you and your family. I am so sorry to hear about the passing of your Mom. My thoughts and prayers are with you and your family.